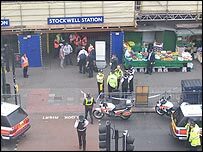 [BBC] - A man has been shot dead by armed U.K. police officers in an incident at London's Stockwell Tube station. Passenger Mark Whitby told BBC News he had seen a man of Asian appearance shot five times by "plain-clothes police officers" with a handgun. "I saw the gun being fired five times into the guy - he is dead," he said. WagNews: Dan Copeland, another eyewitness has just told BBC television that the man who was shot was not carrying a bag. I heard an eye-witness account on Sky News saying man pursued was wearing a blue fleece, jeans and baseball cap. I didn't hear Mark Whitby the most quoted eye-witness mention a heavy black coat. no-one saw any kind of bag. Yet only eye-witness statements on the web I can find now are all mentioning heavy black coat, unsuitable for this time of year. Anybody else notice a problem with their internet server over the last hour or so? (it's 2.45pm now). Sounds like an execution. Why was he shot? 20 police officers with guns should be able to just arrest him, or at least shoot him in his legs or something. Of course they are afraid too, but some cool reason must be expected from professionals. And if he was carrying explosives it must have been very dangerous to shoot him? And how could they know he couldn't be an important witness? Are they trying to provoke some people to get really desperate in order to solve the case? How many innocent lives will that cost? Also this recalls the story about someone shot on the morning of the first bombings. same as it ever was...? related to those shadowy units who set up and let the Omagh bombing happen? Police are preparing specific shoot-to-kill orders to combat suicide bombers. winged gods stood beside the throne of Zeus. wearer behind the mask is anonymous. Reconnaissance Regiment&aps (SRR) will be operational from April 6th 2005.
growing need for special reconnaissance capability." Review New Chapter in July 2004.
specialist skills and activities related to covert surveillance. Special Forces and be a part of the UK Special Forces group. to meet a growing worldwide demand for special reconnaissance capability. command of the Director Special Forces and be a part of the UK Special Forces group." general officer commanding in Northern Ireland. "It is rubbish to suggest that we were mavericks," the FRU source said. establishment knew what was happening." Kerr was known for his "gung-ho"
counter-intelligence squad. He was a senior instructor with the Special Intelligence Wing between 1985-1986 and then moved to Ulster as FRU chief. "He had no moral qualms about anything that we were up to," the FRU source said. "And he knew of every decision taken by his men. quickly. That means the enemy is constantly in a state of terror and panic. Its an old SAS tactic." newly-created Special Reconnaissance Regiment will work closely with MI5. " for overseas operations, particularly those against international terrorism." shadowy organisation which spied on IRA terrorists. who the bombers associated with and where they were recruited into al-Qaeda. operating in Britain and prevent future attacks. Might he not have been one of the patsies from one of the two earlier bombings who escaped at the time, and had been in hiding since then? Obviously the police would have to execute him to prevent his story coming out, and that would explain the running away and hunted look.